Where can I play Jigsaw World? You can play the game in your browser on Facebook. The Facebook version of Jigsaw World is not available for mobile devices, however, we do have a separate Jigsaw World app for Android devices. Where can I find help for the Jigsaw World mobile app? This FAQ is for the Facebook version of Jigsaw World, played on PC/Mac. If you have a question about the Jigsaw World mobile app, please contact us using the button below and mention that you are using the mobile app. The game is only available in English, however, most of the game is picture based which allows players from all over the world to access and enjoy it; we have lots of players who speak different languages and still enjoy the game a lot! If you have any questions, please do let us know and we’ll do our best to help! How can I make sure I see posts from Jigsaw World in my Newsfeed? First, make sure you have ‘liked’ our Community page using the like button below the game. Then, to make sure Facebook shows all our posts in your Newsfeed, visit our Community page and click the ‘Follow’ or ‘Following’ button, then choose ‘See first’. I have an idea/suggestion for the game, can I share it with you? We’d love to hear your feedback! Drop us an email using the Contact button below, or let us know on our Facebook page! We really appreciate all feedback we receive, and while we can’t include every suggestion in the game we do listen to all that our players have to say and try our best to include them where possible. I really love Jigsaw World! Can I do anything to help? We’re glad to hear that! Please ‘like’ us using the like button just below the game. You can also consider purchasing Jigsaw Coins as it helps to support us and pay for improvements. It would also really help if you could get as many new people playing as possible. How do I play Jigsaw World? First, you’ll need to choose a jigsaw from your collection. Once you open a jigsaw, simply click and drag the pieces to put them together. When you place two correct pieces next to each other, they will click into place and stay together when you move them around. The buttons and menus at the top of the game have lots of helpful options such as showing a guide of the puzzle, opening a piece tray to put loose pieces in and selecting all the edge pieces. You can leave a jigsaw and come back to it at any time, however, make sure to click File>Save Position to save your progress to your account before you leave! How do I get more jigsaws? To purchase more jigsaws with your Jigsaw Coins, please visit the Jigsaw Store in the game. How is my reward determined? The reward you receive for completing a jigsaw for the first time will vary based on the number of pieces. You will only receive coins the first time you complete a jigsaw. You will not receive Jigsaw Coins for playing jigsaws you’ve made yourself or received as a gift. How do I move around the jigsaw? Use the right click button on your mouse to drag the jigsaw around. You can also use the scroll wheel on your mouse to move up and down, and drag a piece towards the edge of the jigsaw to move in that direction. How do I rotate the pieces? In Jigsaw World, all the pieces are already the correct way up so there is no need to rotate them! Can I select more than one piece at once? Yes! Simply click on the background and drag the box that appears over all the pieces you want to select. Alternatively, you can hold down the Ctrl or Shift key on your keyboard and click the pieces to select them all. You’ll need to click the first piece twice, and you must be in normal mode (not full screen) to use the keyboard. You can then move these pieces together in the normal way. When you’ve finished, click anywhere on the background or on another piece to stop selecting these pieces. Help! I can’t find the last piece of my jigsaw. Sometimes pieces are hidden underneath the jigsaw, or at the very edges of the playing mat. Don’t worry, there are no missing pieces in Jigsaw World! To help you find that pesky last piece you can use the ‘Arrange pieces around edge’ button, which should bring the piece to the edge of your jigsaw. How do I make my own jigsaws? Click the ‘Create a jigsaw’ button. You’ll be able to choose a picture from your computer or your Facebook account. You can also adjust the number of pieces and give your jigsaw a name and description, as well as choose the album it should go in. You can create up to 3 jigsaws per day – you can increase this limit by getting more stamps on your loyalty card. I started a jigsaw last time I played, but now it is back to the beginning! Make sure to always click File>Save Position before you leave a partly completed jigsaw to prevent this from happening. How do I hide or delete jigsaws from my collection? You can hide all your completed jigsaws by unticking the box next to ‘Show completed’ when you are in your jigsaw collection. This will hide all the jigsaws you’ve already finished, but allow you to go back and do them again later if you want to, by re-ticking the box. You can also permanently delete jigsaws from your collection by right clicking on them and choosing “Delete from collection…” You can select multiple jigsaws at once by holding the Control key on your keyboard and left clicking them, or left clicking and dragging a box around all the jigsaws you want to select. Please note that deleting jigsaws is permanent and cannot be undone. How do I use albums in my jigsaw collection? Whenever you get a new jigsaw it will already be in an album. You’ll also be asked to pick an album when you create your own jigsaw. You can move jigsaws to different albums whenever you wish – to do this, right-click on the jigsaw and select ‘Move to album…’, then choose which album you want to move the jigsaw to. You can select multiple jigsaws at once by holding the Control key on your keyboard and left clicking them, or left clicking and dragging a box around all the jigsaws you want to select. You can also make your own new albums, using the New album button, as well as renaming or deleting an album by clicking it in your albums list and then clicking the Rename album or Delete album button. When you delete an album, make sure to select a new album for your jigsaws when prompted, to ensure your jigsaws are not deleted! The View All section of your collection will always show all of your jigsaws, regardless of which album they are in. What do I need Jigsaw Coins for and how do I get them? Jigsaw Coins are used to buy new sets of jigsaws in the game. You will receive Jigsaw Coins after completing a Jigsaw for the first time. You will also receive 10 free Jigsaw Coins for each day that you log in. Coins can also be purchased through Facebook – you can purchase Coins in the Jigsaw Store in the game. I'm on a computer - why does the price for Coins change when I click to buy them? Facebook does not share their exchange rate, or what currency a player uses, with us. The prices for Coins in Jigsaw World are set in US$. If you’re using a different currency we use a current exchange rate and your country to give a guide for what the Coins might cost, so this might vary very slightly from the actual cost. Don’t worry though – you’ll always have the chance to see the actual cost, in your selected currency, in Facebook’s purchase window before you decide whether to make the purchase. Is buying Jigsaw Coins safe? I am worried about using my credit card online. All purchases are processed securely by Facebook, and we do not have any access to your payment details. Facebook processes millions of dollars worth of payments each day. If you do have any problems with your order, please let us know and we can help. You can learn more about Facebook payments, including which payment methods are accepted, here. Why do I have to pay for Jigsaw Coins? They should be free! Jigsaw World costs money to make and keep running. We have to pay developers, rent servers and pay for images – basically we need players to support us so we can keep the game running for everyone. We know some players can’t or choose not to purchase Jigsaw Coins – it’s possible to play the game without buying anything, you just won’t be able to get new jigsaws as often. We’re really thankful to the players who choose to support the game by purchasing Jigsaw Coins! When I try to buy Jigsaw Coins, the game goes blurry but the payment window doesn’t appear. This is an issue which occasionally occurs in certain browsers. Please make sure your browser is up to date, and if the problem persists, check for updates regularly as the issue should be resolved soon. In the meantime, you should be able to purchase Jigsaw Coins using a different browser. How do I add friends in Jigsaw World? Your friend bar only shows people who are your friends on Facebook. This means that you need to send them a friend request or confirm new friend requests for them to appear in your friend bar. Once you do this, they should appear automatically if they also play the game. How can I find more friends who play the game? You can invite your Facebook friends to play or visit our Community page and befriend other fans of the game. How do I send jigsaws to my friends? You can send jigsaws that you have made yourself to your friends. To do this, find the friend you want to send the jigsaw to in your friend bar, and click on their picture. Choose Send Jigsaw, then choose which jigsaw you’d like to send and click Send Jigsaw. Can I send a jigsaw to more than one friend at once? This is not currently an option in the game, however, you can send as many gift jigsaws in one day as you would like, and you can send the same jigsaw to different friends in the same day. How many gift jigsaws can I accept each day? You can accept up to 4 gift jigsaws per day – you can increase this limit by getting more stamps on your loyalty card. How do I change my Privacy settings so that anyone can send me friend requests? Go to any page on Facebook, click the down arrow in the top right and select ‘Settings’. Then select ‘Privacy’ on the left hand side. Under ‘Who can contact me?’ set ‘Who can send me friend requests?’ to ‘Everyone’. How do I make Jigsaw World visible on my public profile? Hover over ‘APPS’ then click ‘More’ on the left hand side of your Facebook homepage. 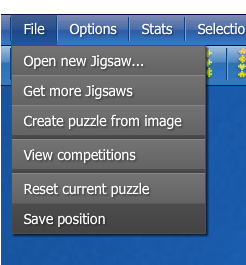 Hover over Jigsaw World and click the little grey cog, then choose ‘Edit Settings’. Change the ‘App visibility’ to ‘Public’. Then go to your Facebook profile page and click ‘More’ under your cover photo. Select ‘Manage Sections’ and tick ‘Apps and Games’ so that this section is visible. Help! I’ve been blocked from sending Friend Requests! Sometimes Facebook will block a user from sending Friend Requests if they have had too many of their requests go unanswered or be rejected. This is usually a temporary measure, and in the meantime you can still accept friend requests from others. To try and minimise the risk of this happening, try sending just a couple of requests at once and waiting for them to be answered before sending more. We also recommend sending a message to the person whom you are adding to introduce yourself – if you have received a request, you may need to check the ‘Filtered’ section of your Facebook messages to see if the sender has messaged you. Can I hide a friend from my friend bar? Currently you cannot hide a friend – if a friend is on your Facebook friends list and plays the game, they will appear on your friend bar. If you remove them from your friends list, they will automatically disappear, but this can take a little while and you might need to clear your browser’s cache. What is the Game Club? Game Club allows you to claim free Coins in Jigsaw World in return for trying out some of our other games! Play & Earn shows you the games you can play to earn Coins in Jigsaw World, as well as the tasks you need to do to get your Coins. There are also instructions for how to claim and links to the other games. Get Code lets you get a 4 letter code once you’ve completed a task. You should click this button in the other game you’ve played to get Jigsaw Coins. You can also click it in Jigsaw World to get codes for rewards in other games. Redeem Code lets you enter your 4 letter code from another game to get your Jigsaw Coins! The Loyalty Card allows you to collect a stamp for every (US)$5 you spend in the game. When you fill a row of stamps, this will upgrade your account to the next level, all the way up to our best account, the Gold account – a higher level means you can create more of your own jigsaws each day, store more in your collection at once, create jigsaws with more pieces and accept more gifts from your friends. Please clear the cache through your browser’s settings. 1. Check that third party cookies are enabled in your web browser’s settings. 2. Try using a different web browser to see if the same issue still occurs. 3. Make sure you are using the most up to date version of your web browser, and you have the most up to date version of Flash Player installed for that browser. 4. Make sure that Flash Player is set to ‘Allowed to run’ in your browser’s settings. Still not working? Facebook or Jigsaw World might be having server problems, so wait for a while and try again. If all else fails, let us know and we will try and help you further. Where can I get the latest Flash Player? You can get the latest Flash player here. If you have the latest version but your browser still says you need to update, try making sure that Flash Player is allowed to run in your browser’s settings. How do I find out my Flash Player version, or check that it is allowed to run? Visit this page to find out your Flash Player version and for instructions on how to enable Flash Player in your browser. In Google Chrome: Click the 3 lines in the top right, and go to ‘Help >’,’About Google Chrome’ – Chrome should automatically start to update if there is an update available. Firefox: Click the 3 lines in the top right then Help, then choose About Firefox – Firefox should automatically start to update if there is an update available. Edge: Edge is updated automatically when you update Windows – please make sure you’ve installed the latest Windows updates to ensure you get the most up to date version of Edge. Safari (on a Mac): Safari is updated automatically when you update macOS – please make sure you’ve installed the latest macOS updates to ensure you get the most up to date version of Safari. How do I check that third party cookies are enabled in my browser? When I try to type in the game nothing comes up! Make sure you are in normal mode (not full screen mode), since Flash Player does not allow typing in full screen.